2016 Record Warm Surface Temperatures: The Party’s Over! As expected, and thanks to the big 2015-6 El Niño, the National Oceanic and Atmospheric Administration (NOAA) has announced that 2016 is the warmest year in their 150-year long global surface temperature record. They didn’t mention that there are signs that global average temperatures are headed back to pre-El Niño values, which may put them near the range of the long “pause” in warming beginning in 1997 that ended with the recent El Niño. Temperatures have fallen to within approximately 0.15⁰C of the average since the end of the last (1998) big El Niño and the beginning of the recent one. These are “bulk” data for the lower atmosphere. In this record, the “pause” from mid-1997 through 2013 is obvious. It will be interesting to see where this record settles out, as the early 2017 data look very “pause-y”. We are also suffering from the problem that NOAA’s (the folks who made today’s announcement) record is the “pause-buster” version that used a new record of sea-surface temperatures (designated ERSSTv4) that became progressively warmer, beginning in 1998, compared to its predecessor (ERSSTv3). It also raised very good buoy temperatures to match very bad ship intake tube temperatures. Just inside a large hunk of conductive metal sitting in the sun isn’t a good place to take the water temperature. One increasingly popular recent surface temperature history is “reanalysis” data in which temperatures are transformed onto a tight latitude/longitude grid that provides a spatially “level playing field”, bypassing the problems that occur as weather stations move, or go off or on-online. You can also see the temperature peak here, and that we are approaching pre-El Niño values. It looks like the warm party is breaking up. 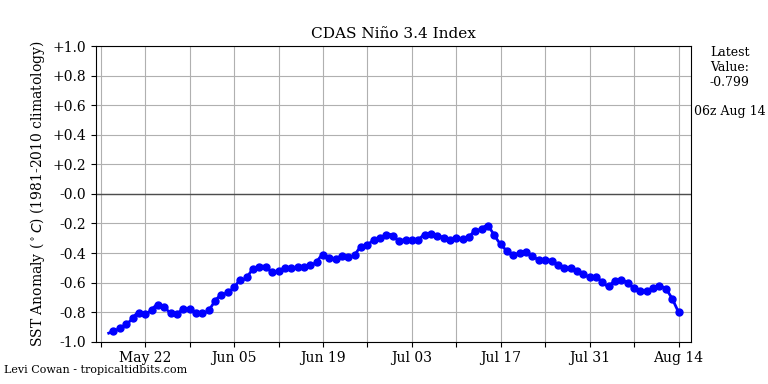 And we have not even had a la Nina so as to complete the ENSO cycle. La Nina was a nearly affair late 2016 but did not quite happen. Until recently, the ENSO meter 9on WUWP) was reading close to +0.5 degC with many agencies predicting a second El Nino to follow on from the strong 2015/16 El Nino. However recently, the ENSO meter is now tracking neutral and some agencies are giving a weak possibility for a La Nina late 2017. Obviously we are unable to predict what ENSO will do, but we are able to predict what will happen should a La Nina develop. Whilst the satellite is less sensitive to La Nina than it is to El Nino (possibly because with El Nino there is increased convection carrying the heat up to the troposphere to where the satellite takes its measurements), if a La Nina develops late 2017/early 2018 then we can expect to see the satellite temperatures to drop further back making the 2015/16 a short lived spike much like that occurring in 2010 following the strong El Nino of that year. That will mean that the PAUSE is likely to once more reappear but this time be some 20 years in duration. This happening (should it occur) will make the divergence between observational temperatures and model prediction even greater, it will suggest that Climate Sensitivity to CO2, if any at all, is lower than AR5 acknowledges, and it will make AR6 more difficult to write. Let us hope that a strong La Nina develops in 2017, which will then reinforce that all one sees in the satellite data is ENSO natural variations and short lived volcano cooling. Richard, I have been saying for many years that the Satellites do not measure what we experience on the ground, or Sea Surface. What they appear to measure is the heat being lost by the Earth. NASA’s own MSU Satellite (UAH/RSS products) measures the lower trop – the exact place where “AGW” is supposed to be occur. It doesn’t measure asphalt in car parks or airports where NASA’s GISS temp prefers. And that is with massively adjusted data. 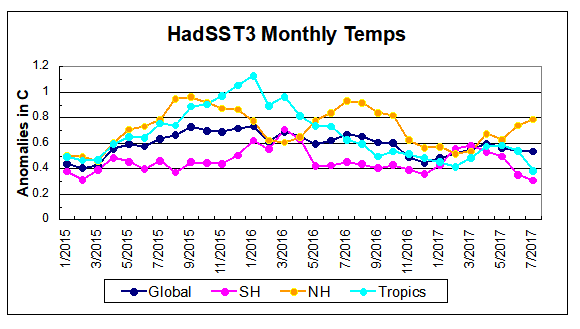 The drop in SSTs is even more pronounced. Ron, is the Global temperature the mean of NH and SH, (looks like it to me)? Should it not be adjusted to allow for the water mass difference between the hemispheres i.e. biased to the southern hemisphere, or is that just over-complication of the issue? Jack, I checked and it is not a simple averaging of NH and SH. I did not analyze to see how much SH is weighted. The documentation says the Global Average comes from averaging grid cells, which would favor SH. As you point out, Jack, it also makes the Global average biased toward the generally higher NH anomalies. I should add that looking at reported Global numbers in the chart above shows them varying month by month by a % or two above or below the mean I calculate on the spreadsheet. Based on the method described it is not obvious why this should be so. Not sure how ‘as usual’ is approriate as a gloss for a chart of ANOMALIES. ?? Fair point Nigel. Rather than “usual” I meant peaking as it has the previous 2 Julys, only lower. So we are a tenth of a degree cooler than 1988. That is really scary. NOAA has just released the July data… The monthly cooling that began in January (with respect to 2016) has continued. The latest HadlSST1.1 data seem to show that El-Nino has been below the threshold since May and La-Nina is unlikely to make an appearance. and it will all bear watching. Yes, it will bear watching. As of the end of July, monthly values for 2015-17 were way behind either 1982-84 or 1997-99 in chasing La-Nina. They don’t seem to care what CO2 does? Your plot suggests that it has been running in positive Territory until around 10th August.when temperatures have dropped significantly. “Neutral” is an anomaly between +0.5 and -0.5 C.
The SST in this area was flirting with a forecast of El Nino and now it is flirting with a forecast of La Nina. It takes persistent conditions for a few months to really mean anything. The winds above the ocean have to take on certain characteristics as well, because it these which determine the amount of upwelling of cold water. I think they have an underlying, warmunista, tone of WISHING for El Ninos but that does not matter. All the facts are stated correctly. ERSSTv4 replaces ERSSTv3….But, but, I thought the science was settled and that I was an evil person for wanting to examine the accuracy of ERSSTv3 when it was being used to prove any number of seemingly unrelated things. Turns out the Science wasn’t so settled after all but this time they really, really, really mean it. GOOD GRIEF HOW MANY TIMES? Oscillation is the key word here. The news is, nothing to see, and the idiot implication somehow and by some enormous stretch of a fervid imagination – man made CO2 is summat to do with it? What we DO know: Solar radiation heat, lunar gravity, Coriolis, conveyor, drift, upwelling and climate influence. Man made COs is not the culprit and never was. COs ? ………….. CO₂ that’s better. It’s too late to wish for El-Nino… it died in June last year. They may be wishing for La-Nina? After all It created the 1998 warm year. El-Nino was in 1997. 15 of the 16 warmest years have occurred since 2000 and 2017 is on track to be the warmest ENSO neutral year ever in the surface temperature record. Last record cold year was in 1909. 2000 to 2009 was the warmest decade going back to 1880 and the current decade is smashing the 2000-2009 record so far.